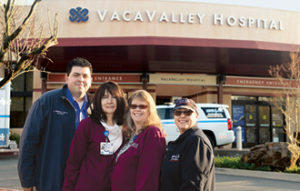 Celebrating a partnership that helps reduce hospital readmissions are Medic Ambulance’s James Pierson (far left) and Elisa Martinez (far right) and NorthBay Complex Case Managers Carrie DeFere and Allison Short. They’ve been discharged from the hospital with a list of new medications, appointments for respiratory therapy or cardiac rehabilitation, instructions to follow a new diet and the sobering realization that life is now different. It’s a confusing whirlwind that some heart failure and chronic obstructive pulmonary disease (COPD) patients face. There’s help in maneuvering through this new life phase, however. NorthBay Healthcare and Medic Ambulance have been working together to provide a “care bridge” for these newly discharged patients, with the goal of keeping them at home and preventing complications that could land them back in the hospital. The Community Paramedicine alliance was created just over three years ago as a pilot program, according to James Pierson, vice president of Operations for Medic Ambulance. It has proven to be very successful, added Shelley Stelzner, manager of Outpatient Case Management for NorthBay Healthcare. The Community Paramedicine Program was initially envisioned to be a pilot project between Medic Ambulance and all healthcare organizations in Solano County; however, only NorthBay Healthcare has opted to participate in the collaboration. There are only three other collaborations between healthcare facilities and ambulance services within the state of California. More than 300 patients have been assessed since the program began and it has reduced readmission rates to around 7 percent, whereas the state average is more than 11 percent, Shelley said. NorthBay complex case managers identify those patients who could be at high risk of readmission due to co-morbidities, such as diabetes, or psycho-social factors. They then meet with the patient to explain the program and see if they are open to the idea of home visits after discharge, Shelley explained. If they are, Medic Ambulance paramedics with special training will go to the patients’ homes after they’ve been discharged from NorthBay Medical Center or NorthBay VacaValley Hospital. They arrive in vans, not an ambulance, and the paramedics are dressed in polo shirts. Paramedics and NorthBay’s case managers share results of patient assessments to determine appropriate follow-up care. The program works so well because paramedics have extensive training in managing chronic diseases and, because they are so mobile, they are a great addition to a patient’s care team. “For NorthBay Healthcare, the paramedicine program has evolved into a great partnership that helps our patients and reduces the cost of health care in Solano County,” added Nicole Brocato, NorthBay’s vice president and chief quality officer.